VERIFY: Does coconut oil, vinegar treat head lice? No, experts say conditioner and a comb are the gold standard. Does coconut oil, vinegar treat head lice? Journal of Pediatric Nursing- "Home Remedies to Control Head Lice"
Kids are out and about sharing hugs and spreading holiday joy, but be careful their not spreading something else. A viewer read on Facebook that coconut oil and apple cider vinegar can help kill and remove head lice. She asked us to verify whether it's true. Our team of researchers dove into studies from the Journal of Pediatric Nursing and two local lice experts. They confirm, it's not supported by science: vinegar won't dissolve nor smother lice to death. "It's just somebody trying to claim an expertise," Karen Franco, owner and founder of Advice on Lice in Kensington, Maryland, said. The post claims the vinegar and coconut oil help dissolve the lice's "outer skeletal shell instantly." Franco says that's bogus. Franco says what the author of the Facebook post probably means is that the concoction would dissolve the glue excreted by the louse to bind the nit to the hair shaft. But, even that wouldn't work, because the louse's glue is made up of the same properties as hair. "The female bug's egg is laid on a hair shaft, it's secreted and glued on, Franco said. "The makeup of that actual glue is very similar to hair, so any kind of solvent that might dissolve the glue, might also dissolve your hair. So don't think that's something people are going to actively pursue." Nancy Fields, owner of Lice Happens in Annapolis, Maryland, agrees, the science for a vinegar treatment just isn't there. "There isn't good research our there that's leading to a conclusion that vinegar is something that can dissolve the exoskeleton of lice and therefore kill them," Fields said. Don't think vinegar and oil will suffocate the bugs either. "When it comes to home, do-it-yourself approaches, applying something to the hair and the scalp to suffocate--dubious results at best," Fields said. "I suppose if you put a louse in the middle of mayonnaise jar, over time it will suffocate, but in practice, parents are putting a thin layer or mayonnaise or any other kind of oil..head lice are very resilient." In their combined 30 years of checking scalps, neither Franco nor Fields have ever recommended to their clients to use vinegar or coconut oil. Scientists at the University of California studied at-home remedies to control head lice found that none of them worked to kill, control or suffocate the lice. They along with the CDC advise people to use chemical louse-removal products and combs. 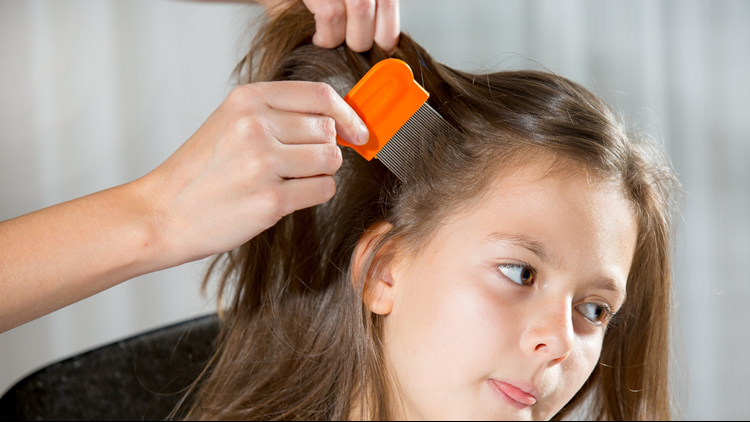 The gold standard for squashing lice hasn't changed: conditioner and a comb. Franco recommends getting ahead of a lice infestation by combing through your childrens' hair at least once a week. So we can Verify, no-- this post is fake.